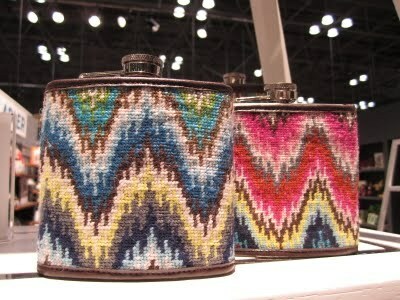 When I saw these charming Jonathon-Adler needlepointed flasks in the December 2011 Allure, I know I had to use the pattern as the basis of Bargello. Not only do I love the colors and its masculine feel, but I can’t afford the $98 price tag. 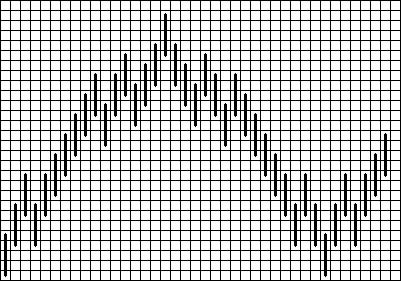 So bargello it is, and I’ve put the pattern below (click picture for full-size chart). On to the colors. Depending on how you’ll be finishing it, go for a single type of thread in these colors: grey, brown, navy, light blue, white, aqua, olive, and yellow. If you like the rose one better, get rid of grey, aqua, and olive, and add taupe, light pink, pink, hot pink, and red. Follow the sequence of colors in the original. I’m planning mine from wool and putting it into my new Lee’s tote. And, of course, I’m using the pink version using threads from my stash including High Cotton, Vineyard Merino, and three kinds of Ty-Di threads. All of these should wear well. 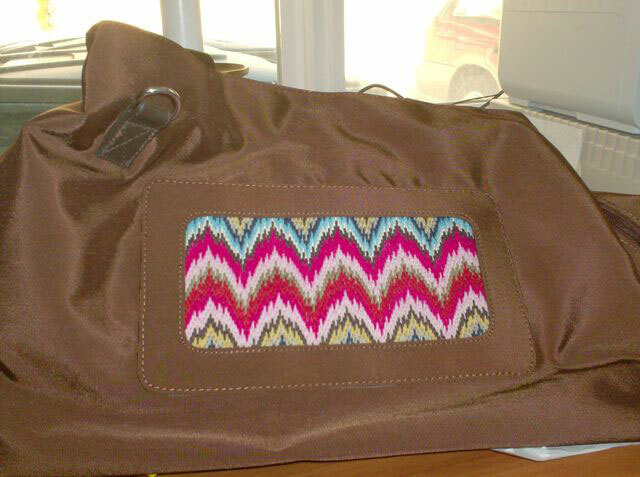 I stitched it up and put it into my Lee Needle Arts tote that has a removable area for needlepoint. I read your blog everyday and can’t tell you how much your encouraging words and ideas have led me to enjoy one of my most favorite pasttimes again. I’ve recently moved and now have an area devoted only to needlepoint. It helps to be organized and makes starting a new project so easy. I use to dread hunting around our old home for my supplies which took away the fun from the start. I’ve tackled unfinished projects and finished quite a few. Success! I reward myself and buy a new canvas. My most recent project will eventually go into a picture frame from TJ Maxx in order to save money on finishing. If you have an opportunity to explore saving money (this is an expensive hobby) please show us the way. I’d also be interested in lighting. We’ve all purchased special lights and magnifiers that don’t really help. I’m not sure Consumer Reports would tackle this. Could you? Would you? Please keep blogging and happy stitiching! Itoo am addicted to finishing using ready-made frames. You’ll find a summary of how to do this as the main article here in Monday, August 13.